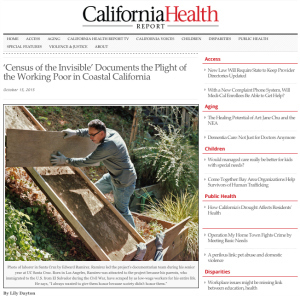 The “Working for Dignity” project by sociology professor Steve McKay’s class are featured in the California Health Report, an independent, non-profit journalism initiative covering health and health policy throughout California. View the article here. Data from the study, photos, and personal stories from local residents who comprise the county’s low-wage workers are available on the project's multimedia website workingfordignity.ucsc.edu. View more news articles featuring UCSC faculty, researchers, and students here.